The last two weekends have included normal winter bee chores: clearing hive openings, checking honey stores, and preventing condensation by changing out damp hive-top towels for dry ones. In addition, I had the unhappy task of doing autopsies on two hives that did not survive early December’s week of sub-freezing weather. I anticipated some loss — such extreme conditions typically weed out colonies with any sort of weakness– but cleaning up dead hives is always sad work. The first hive had a cluster about 6″ in diameter that had eaten its way into the coldest (northwest) corner of its deep, away from the warmer front of the hive and about an inch from a very respectable store of honey in the western above it. This colony appeared to be doing really well in mid-September, with six deep frames of beautiful wall-to-wall brood and a population to match. It also had a very high mite count in late October. 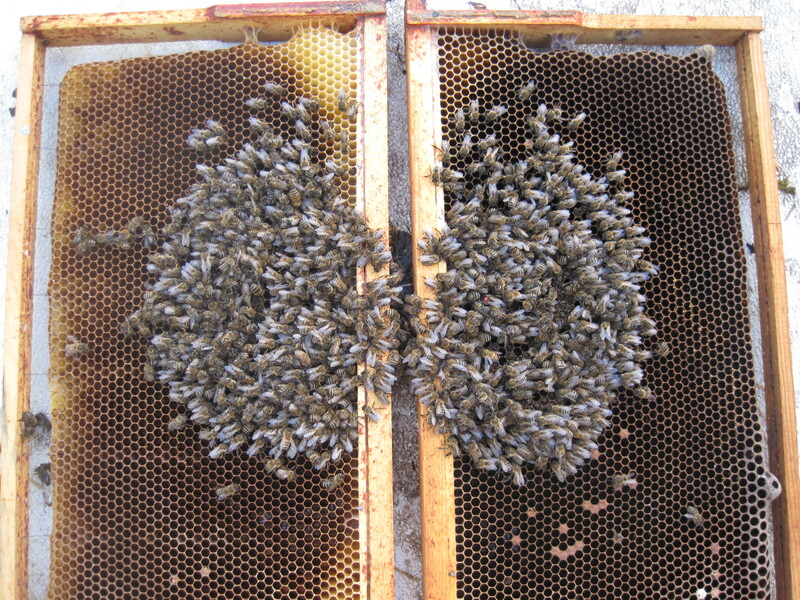 While other surviving hives had similarly high mite counts, this colony’s population was likely diminished by varroa, the cluster losing critical thermal mass and freezing to death. This scenario is fairly typical of my past winter losses; 6″ seems to be the lower limit of viable winter cluster size in my valley. The loss of the second colony was a bit more upsetting. This cluster was at least 9-10″ across deep and western frames with heavy stores above and their 2013 queen safely nestled in its center. While this hive also had a fairly high mite count in late October, their population does not seem to have been seriously diminished by it; in this case, I believe poor location was the downfall of the colony. The hive was sited in an orchard that receives day-long full sun in all but the two weeks around the winter solstice, when the sun dips below the crest of an adjacent hill for most of the short day. While I have successfully carried hives through prolonged cold spells in this location before, I beleive the fact that the cold spell came during this time of shadow prevented the hive from warming and feeding during the day. My other hives are located on a south-facing slope and benefit not only from direct sunlight during clear, cold days, but also avoid the stagnant chill of the valley floor. Past cold snaps may have come later in the winter, so the hives in my valley orchard would have received at least some warming sun during the day. Sadly, this was a strong hive that very likely died because of my failure to relocate it to a more advantageous position. Sorry about you losses Kelli. It is sad that the only thing we can expect in beekeeping is the unexpected. Hope this the last of your losses for the year.